The 13th edition of Eco Expo Asia will be held at the AsiaWorld-Expo on 25 – 28 October 2018 (Thu –Sun) under the theme of “Waste Less Save More for a Low-carbon Future”. 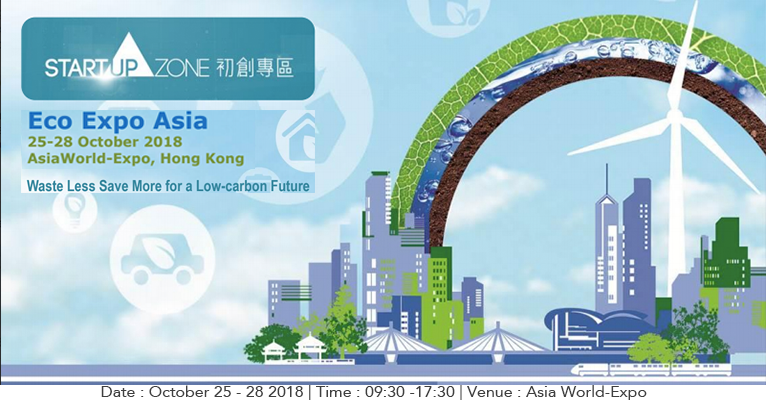 In response to the worldwide commitment to tackle urban environmental issues as well as the upsurging demand for green technologies, corresponding product zones such as Waste Management & Recycling, Water Treatment & Quality management, Green Transportation and Startup Zone will be featured. Get the Special price of 4000 HKD for a Booth in the Startup Zone. Note that 50% can de reimbursed by the SME Exports Marketing Fund (see details below). Reach out to hello@whub.io to receive the Application form. The fund aims to support SMEs for participation in export promotion activities. The maximum amount of grant will be 50% of the total approved expenditure or HK$50,000, whichever is the less. The cumulative amount of grant that an SME may obtain is $200,000. Details are available at www.smefund.tid.gov.hk. Eco Expo Asia is the preeminent trade fair in Asia for green business targeting Business-to-Government (B2G), Business-to-Business (B2B) and Business-to-Consumer (B2C) sectors. With staunch support from the green industry and government authorities in the region, the Fair attracted 335 exhibitors from 18 countries and regions and 14,029 professional buyers from 102 countries and regions in 2017. There were also over 400 government officials from Australia, India, Japan, Korea, Macau, Thailand, the Chinese mainland, the Philippines and Hong Kong visiting the Fair to look for innovative products for environmental protection. On the last day, the Fair was open to the public and there was an attendance of more than 2,500 public visitors. Among the exhibitors were local big names like ALBA IWS, Associated Engineers, Baguio Green Group, China Energy Conservation and Environmental Protection (Hong Kong), FSE Environmental Technologies Group, Hongkong Electric, Hyundai Hong Kong, REC Green Technologies, Robin Energy and SUEZ NWS etc. A number of renowned overseas companies also joined the Fair, including China Faw Group and Chinese Water Industry Group from Chinese mainland, Envac from Sweden, Kanematsu Corporation from Japan, Orgaworld from the Netherlands, Outotec from Finland, UNTHA Shredding from Austria, as well as Villiger Entsorgungssysteme from Switzerland.